There is stage time at an open mic everywhere across the Phoenix metro area most nights of the week. If you are from out of town, trying out new material, or trying comedy for the first time the shows on this list are all show-up and go up. 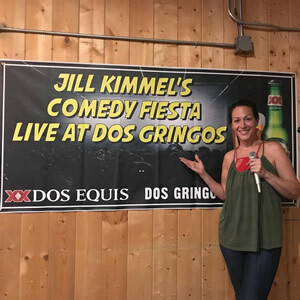 If you are looking for comedy showcases (booked mics), you can find those here. Keep an eye on our social media channels for any last minute changes or cancelations. 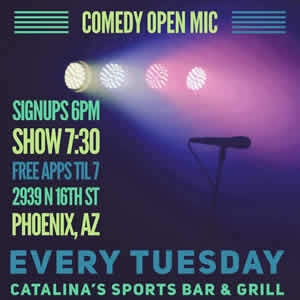 Start lining up for this comedy open mic near the campus of Arizona State University at 7:00 pm when the list goes up. 7:30 pm is when the first comedian jumps on stage and gets things rolling. Same great room, new great night! Sign-ups start at 8:00 pm, first open mic comedian goes up at 8:30 pm. Get more info on the theme and comics of the Thursday Night booked show here. 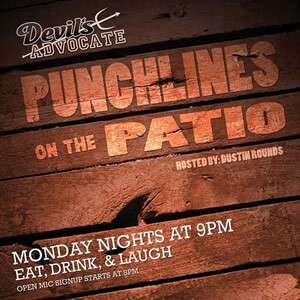 Punchlines on the Patio is a comedy, open mic on the campus of Arizona State University. The list for this regular weekly mic starts at 8 pm with the first comedian going up about 9 pm. This East Valley open mic features comedy, music, and other spoken word performers. The list starts at 7:00 pm, while the first comedian /performer hits the new stage at 7:30 pm. It’s a Comedy Fiesta every week at this south Tempe open mic for comics only. Sign-ups begin at 6:45 pm giving you plenty of time to load up on taco’s before the funny starts at 7:30 pm. Castaway Comedy brings you a weekly comic only open mic near downtown Phoenix. Get on the list starting at 6 pm, and the first comedian grabs the mic and hits the stage at 8 pm. You can also check out the Castaway Comedy Showcase at Sic Sense Theater on Sunday night. 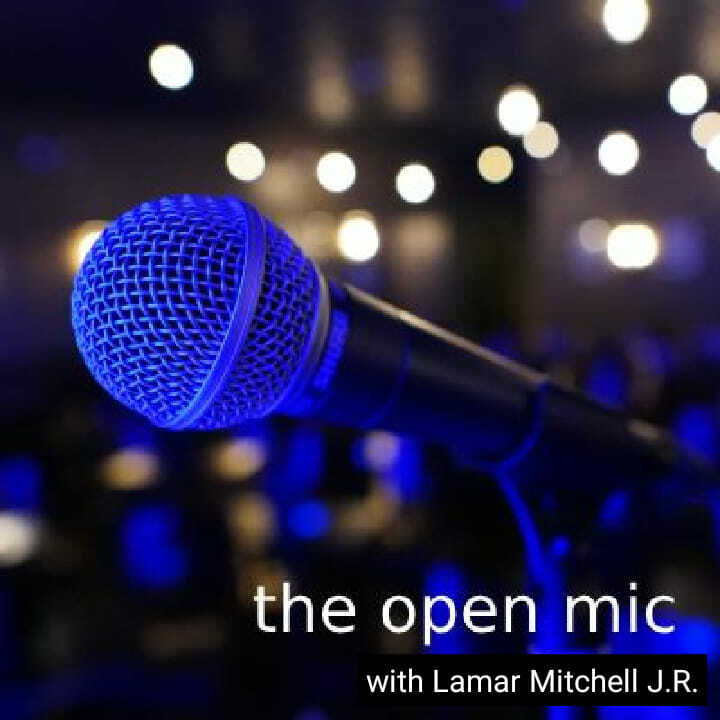 ‍Host – Lamar Mitchell J.R. The show will feature 3 show up go up spots, 5 sign up spots, and 3 booked spots. The sign up will be opened up at 12 PM the day of show at https://stircrazycomedyclub.com/open-mic-sign-up. The Toso’s open mic returns. It is again a mixed mic so not only will include great comedy but also poetry, music and other spoken word performers. The list starts at 6:30 PM, the first performer hits the stage at 7 PM. Roosevelt Row in Downtown Phoenix features a new weekly open mic. Sign-ups start at 7:70 pm and the night begins when the first comedian heads to the stage at 7 pm. The Melrose district of downtown Phoenix is home to The Quail Lounge and a Wednesday open mic for comedy. Get there at 8:30 pm, maybe go up at 8:30 pm when the first comedian hits the stage. 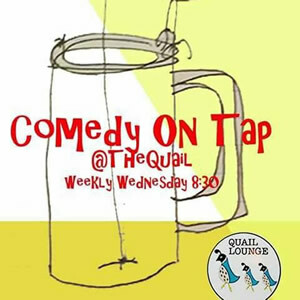 Wednesday night’s mean there is Comedy On Tap. 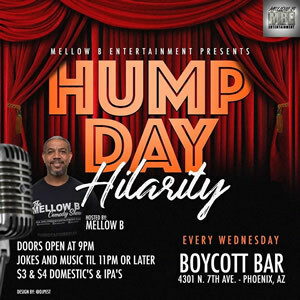 Hump Day Hilarity hits Downtown Phoenix, Jokes until 11 pm and then DJ Mellow B spins music until everyone goes home. Bobby Johnson starts the list early on Facebook if you want to get a jump on the crowd. 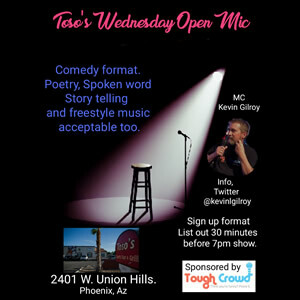 Baseline and Mill Ave in Tempe houses this weekly open mic for comedy. Comedians can get there name on the list starting at 8:30 pm and things rolling at 9 pm. The first Wednesday of each month will feature G.L.O.W. a booked showcase featuring the ladies of Phoenix comedy from 9p-10p. 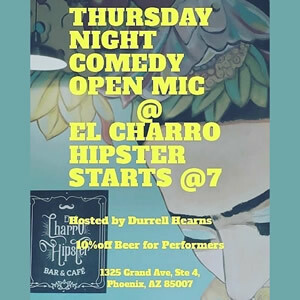 Just outside of downtown Phoenix you will find this bi-weekly comedy open mic. Sign-ups start at 6:30 pm and the night begins when the first comedian heads to the stage at 7 pm. Upcoming Dates: 04/11/19, 04/25/19, 05/9/19, 05/23/19. 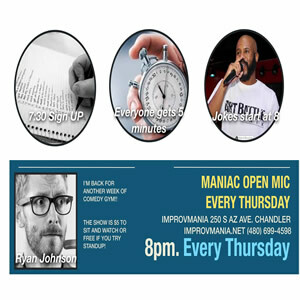 Manic Open Mic is your chance in Chandler to workout your comedy chops. The list gets started at 7:30 pm and a comedian will kick off the night of comedy at 8 pm. Admission is $5 but you get in for free if you are an open mic’er. The west side of Phoenix finds its self a weekly open mic. 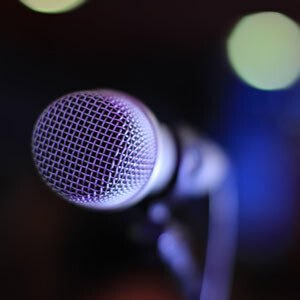 This open mic features comedy, music and other spoken word performers. The list starts at 8:30 pm, while the first comedian /performer hits the new stage at 9 pm. Half Price drinks for open mic’ers. The first Thursday of each month means The Mystery Show and Open Mic. 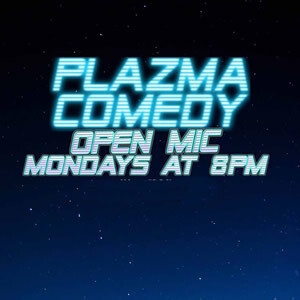 The list gets started with The Mystery Show at 9:00 pm, the first open mic comedian hits the stage at the conclusion of this months Mystery Show. It’s a late night Friday Mic in Sunnyslope. This mixed mic will features a "tip bucket"cash prize at the end of the night. 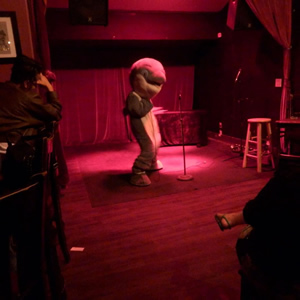 The open mic runs 10 pm – 2 am after the weekly booked show. 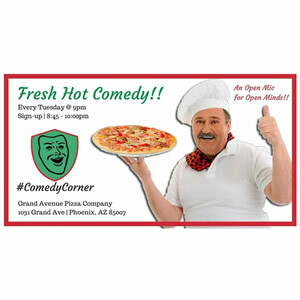 Hashtag Comedy Corner, a Drift Compatible Production, is a downtown Phoenix open mic for comics of all levels. You can get on the list starting at 8:45 pm, first comic goes up at 9 pm. Grand Ave Pizza closes 2 weeks mid-summer and storms can sideline the action, so watch our social media for updates. 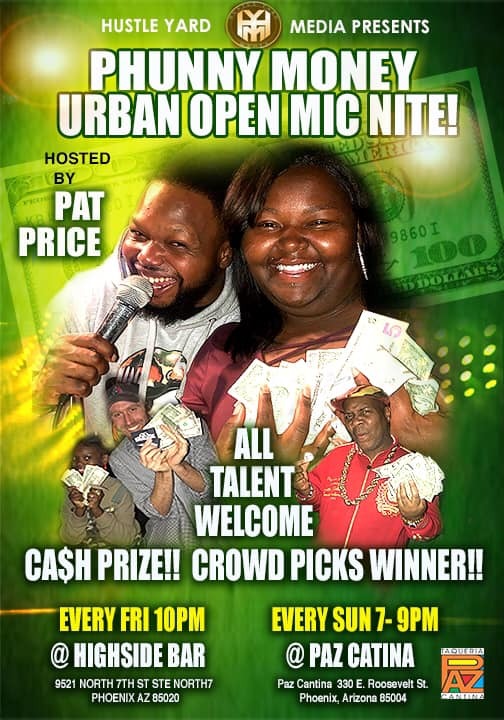 This mixed mic will features a "tip bucket"cash prize at the end of the night. 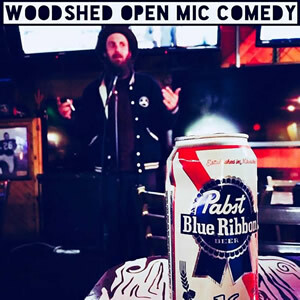 The open mic runs 7 pm – 9 pm.